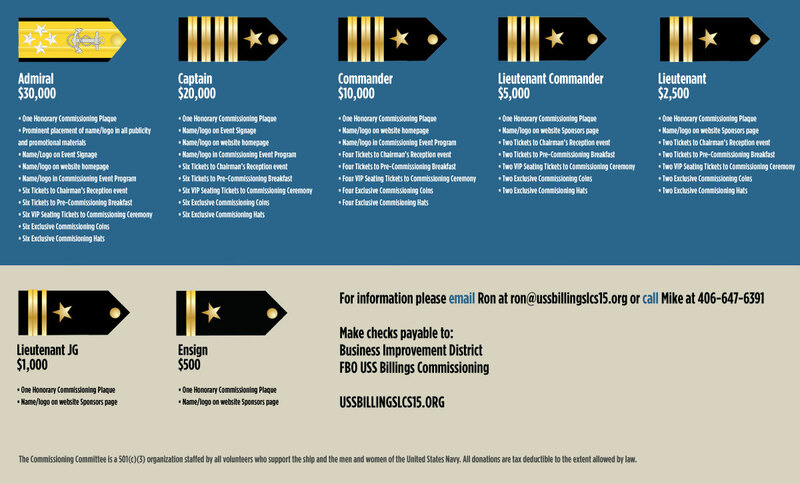 Sponsoring the commissioning of the USS Billings (LCS 15) is a unique opportunity for you, your business or family to support a time-honored event, the likes that have not been seen ever before in the history of our community and our nation. Steeped in tradition, the impressive festivities surrounding the weeklong celebration will inspire you, your family, employees, customers and everyone who participates through sponsorship as the new combat vessel arrives to be officially commissioned as the USS Billings. Sponsors receive various benefits including “Preferred Seating”. General Admission tickets can be ordered by clicking on the “Ticket Registration” button COMING SOON. General Admission Ticket Requests will be honored based on availability. Your participation plays an important role to the Billings community supporting the USS Billings (LCS 15) Commissioning in a way that will make its crew and our nation proud.